Originally from Hyderabad, India, Nadella lives in Bellevue, Wash. He earned a bachelor’s degree in electrical engineering from Mangalore University, a master’s degree in computer science from the University of Wisconsin – Milwaukee and a master’s degree in business administration from the University of Chicago. 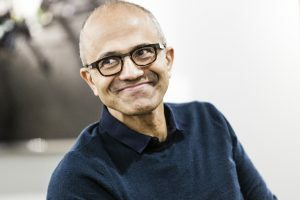 Nadella serves on the board of trustees to Fred Hutchinson Cancer Research Center as well as the Starbucks Board of Directors. He is married and has three children. Images in this section by Brian Smale and Microsoft licensed under a Creative Commons Attribution-ShareAlike 4.0 International License.